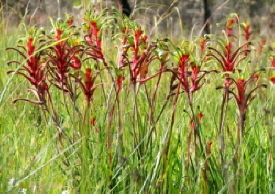 The Red and Green Kangaroo Paw is the Western Australian Floral Emblem. One of around only twelve species of the genus (category) Anigozanthos which grows in the southwest of Western Australia. The plant family Haemodoraceae can be found in Australia, South Africa, the Americas and Papua New Guinea. Found widely throughout the southwest of Western Australia and on sandy soil in the north around Geraldton and the Swan Coastal Plain near Perth. A low shrub that grows from an underground stem. It has broad leaves that are about 30 to 60 cm long and taper to a sharp point. The flowering stem grows to around 1 metre in height. The stem and the bases of the flowers are deep red and are covered with hairs, while the rest of the flower is a bright green. Flowering time is normally between August and October. Jacques-Julian Houton de Labillardiere, the French botanist was the first to collect the Kangaroo Paw near Esperance in 1792. Western Australia Floral Emblem on the 9th of November 1960. The species is protected. Collectors must be licensed. There's more from the Australian Government about the Kangaroo Paw.